The Christian Apocrypha burst into the public consciousness in 2003, following the publication of The Da Vinci Code by Dan Brown. Interest in the wide assortment of texts not included in the Bible has remained strong ever since. Although much has been written and said on the subject, misunderstandings still abound. 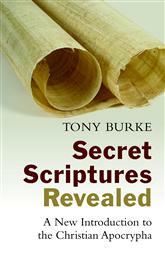 Tony Burke's Secret Scriptures Revealed dismantles the many myths and misconceptions about the Christian Apocrypha and straightforwardly answers common questions like these: Where did the apocryphal texts come from and who wrote them? Why were they not included in the Bible? Is reading these texts harmful to personal faith? The book describes and explains numerous fascinating apocryphal stories, including many that are not well known. Instead of dismissing or smearing the Christian Apocrypha, Burke shows how these texts can help us better understand early Christian communities and the canonical Bible. Citation: Julia Snyder, review of Tony Burke, Secret Scriptures Revealed: A New Introduction to the Christian Apocrypha, Review of Biblical Literature [http://www.bookreviews.org] (2015).